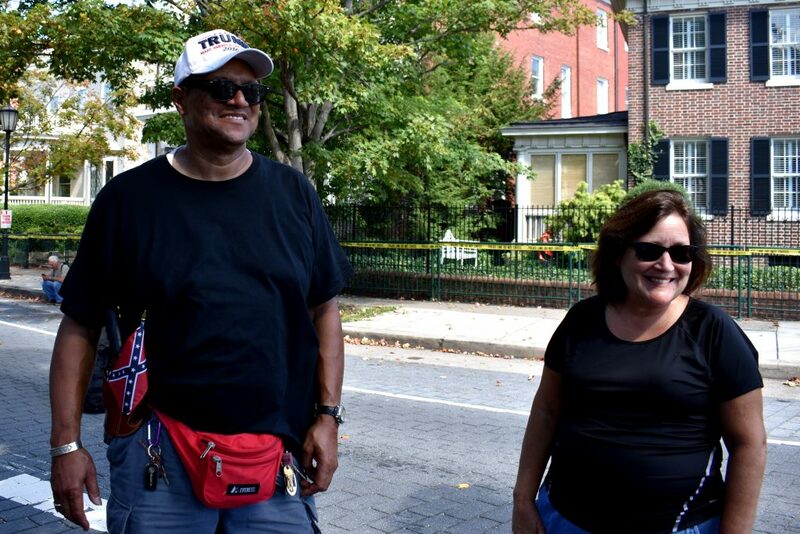 Despite attracting only a few supporters and finding themselves stranded and seeking donations to get home, the trio behind the Lee Monument rally are planning a comeback. 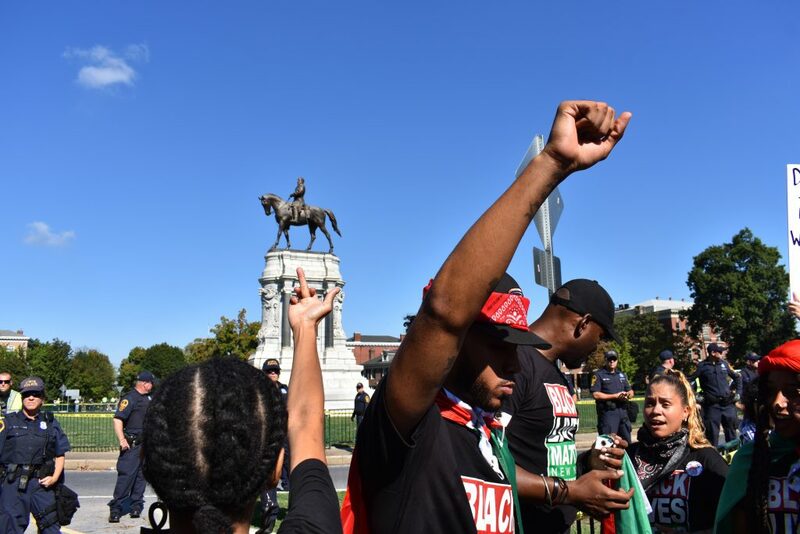 Organizers of the failed rally last weekend Tara Brandau, Tom Crompton, and Judy Crompton have posted a Facebook event called “Protect The General Robert E. Lee Monument – Round 2”, originally planned for December 2nd. Since our first report, they’ve changed the date to December 9th. 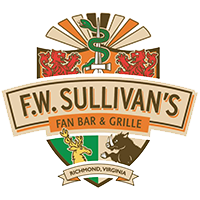 The event will conflict with the Richmond Christmas Parade, which takes place starting at 10:15 AM parallel to Monument Avenue on Broad Street. As of press time, the rally has 16 rsvps; it reached 70 for the previous event, but only 3-4 people joined the organizers. 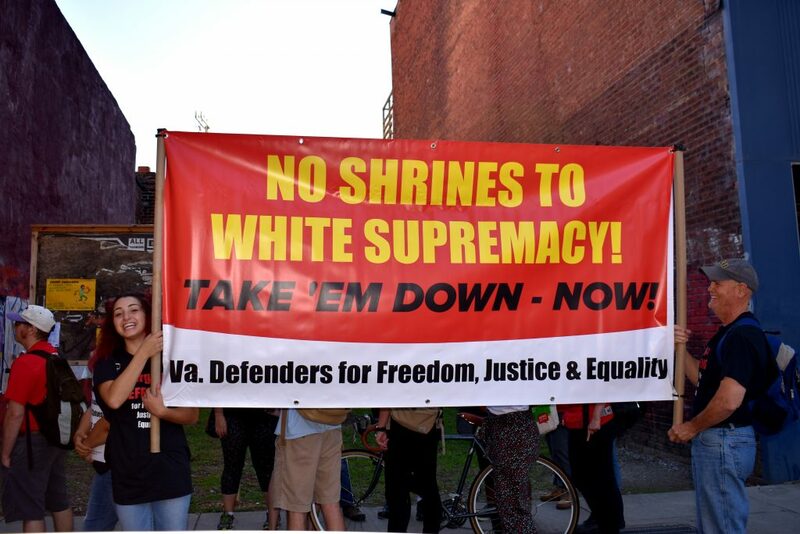 They were dwarfed by an estimated 400 counter-protesters, consisting of local advocates, church groups, the Richmond Peace Education Center, and an out-of-state Black Lives Matter chapter from New York. 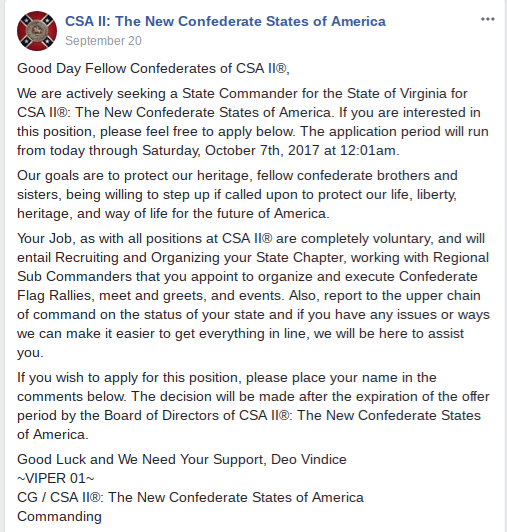 Brandau and the Cromptons claim again to have been invited by a Virginia chapter of the CSA II organization the Cromptons founded, but we’ve been unable to verify that the chapter exists outside of a small Facebook group administered by the Cromptons. 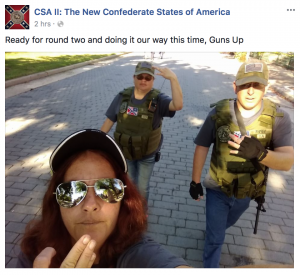 The CSA II has posted a photo with a caption suggesting a heavily-armed presence; “Ready for round two and doing it our way this time, Guns Up”. In response, local residents have harsh words for the trio on the event page, reproduced below. 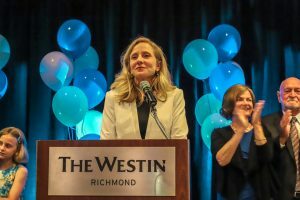 As of 5:30 pm the organizers of this supposed rally have locked their event page, banned certain people including RVA Mag’s journalists, and removed any negative comments from residents living in Richmond. 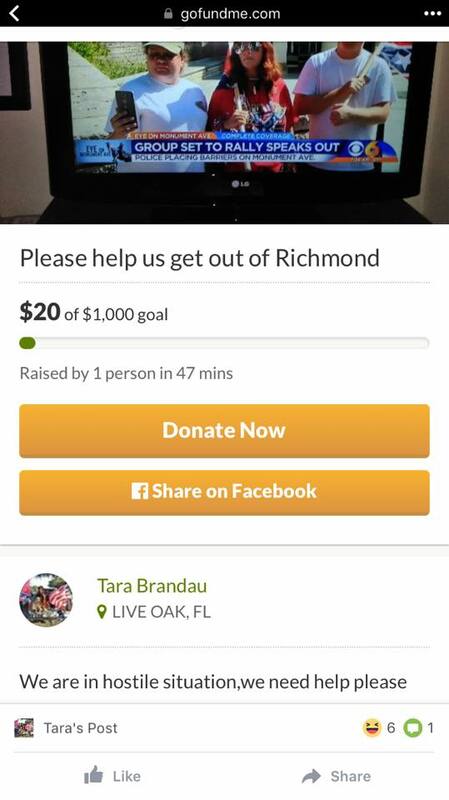 In a fitting end to their misadventures, the organizers of the neo-Confederate rally today reached out to supporters for donations via GoFundMe, raising $220 from two individuals before deleting the campaign. 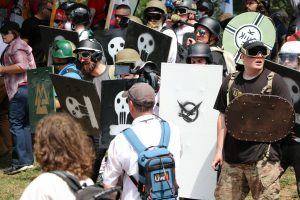 The group used social media throughout the days leading up to the rally to advertise sales on Confederacy memorabilia which they were selling from the back of their pickup truck. The funding request came shortly after a confusing Facebook live video by co-organizer Tara Brandau claiming that they were being chased by a swarm of attackers as they drove away – a narration informing viewers that their tires are flat. However, when they stop the truck, the camera shows what appeared to be two people on commuter bicycles and several police officers in a peaceful, non-threatening situation. A previous video documented their departure from the rally site as several calm police led them out. Brandau called their exit an ‘extraction.’ When the small group reaches their pickup truck, they state that the tires are slashed before starting the engine to leave. Shortly before posting this story, the group deleted many social media posts, including the GoFundMe campaign and previously-mentioned videos. 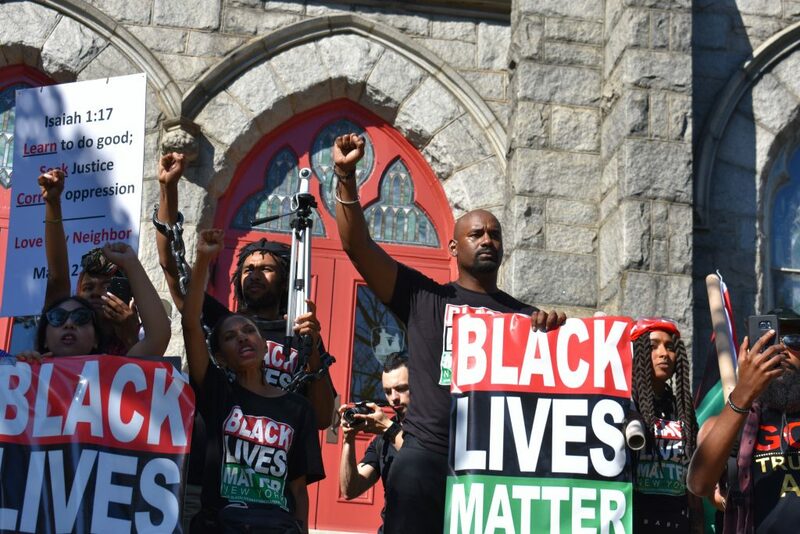 They also deleted a dubious post claiming that Black Lives Matter had tracked them and surrounded them at their lodgings; in another, that shots were fired by counter-protesters, despite police statements to the contrary. *This story has been updated as of 9 PM. 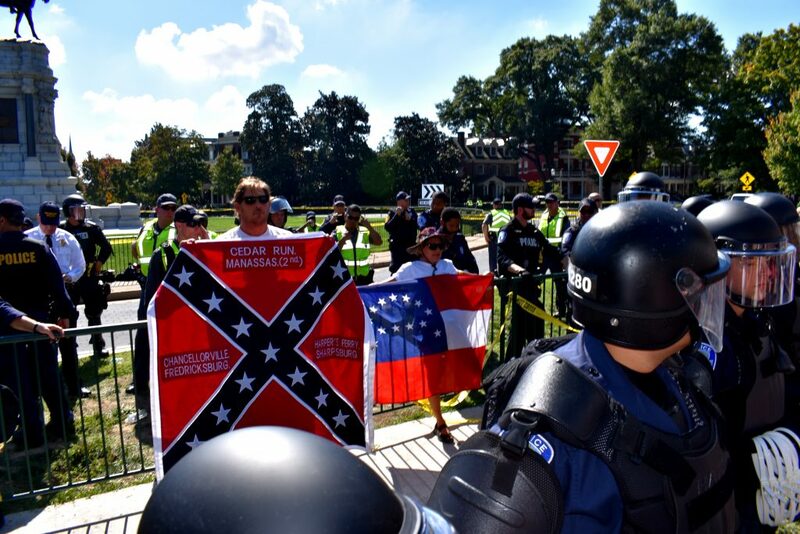 Days of tension broke on Saturday as the neo-Confederate rally came to a peaceful end. 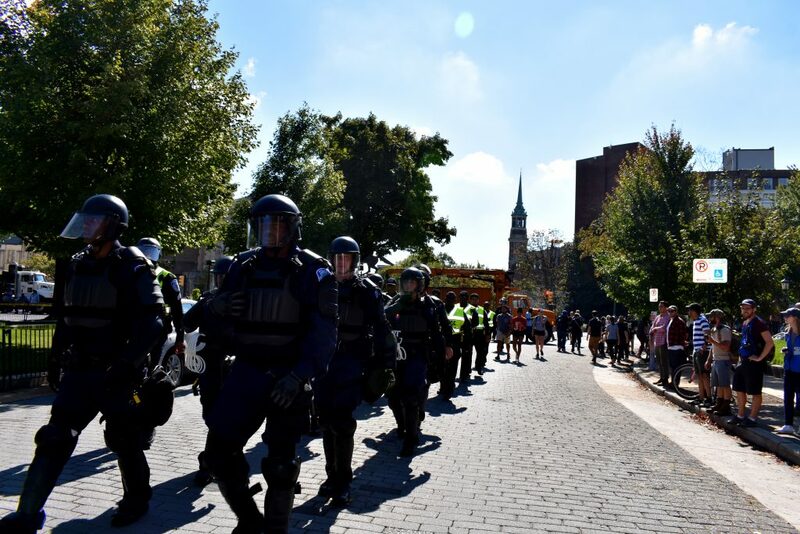 Police have since reported seven arrests; one for disorderly conduct, two related to possession of weapons, and four for wearing masks in public. One woman was detained by police during a spirited verbal debate, and the pickup truck driven by the out-of-state organizers was towed due to a flat tire. 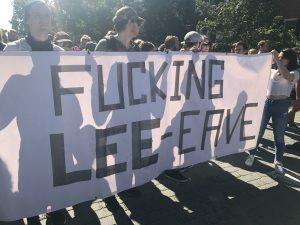 Some 400 people were assembled, with members of the media alone greatly outnumbering neo-Confederates, who congregated in twos and threes throughout the assembly. Separated by riot police, a crowd of counter-protesters and this monument supporter traded insults. 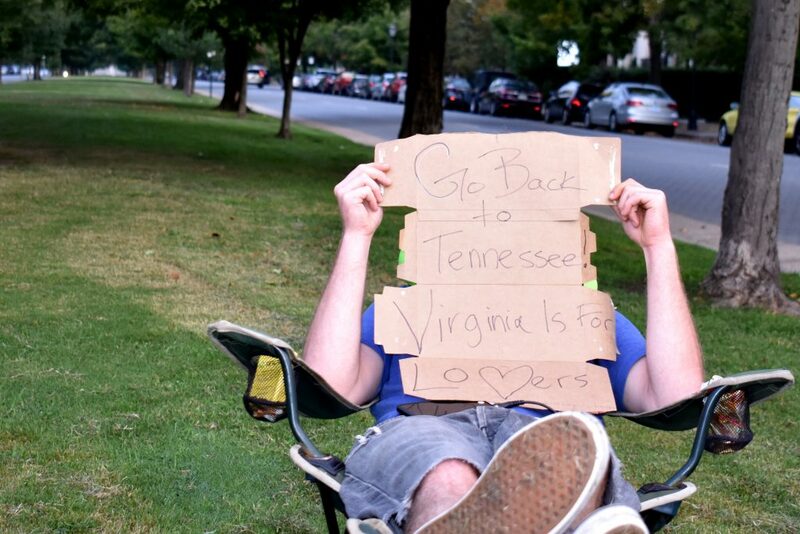 One earlybird protester arrived at 4 AM with lawnchair, coffee, and sign. 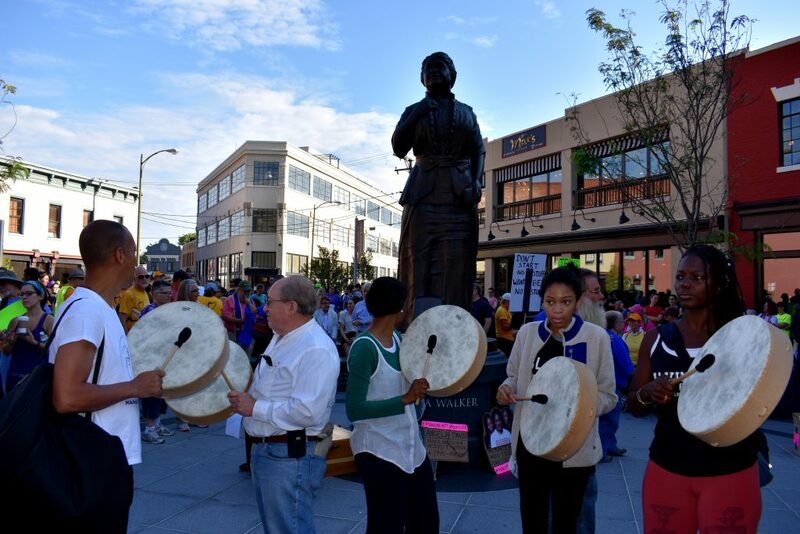 Drummers at Maggie Walker assembled for racial justice and peace. 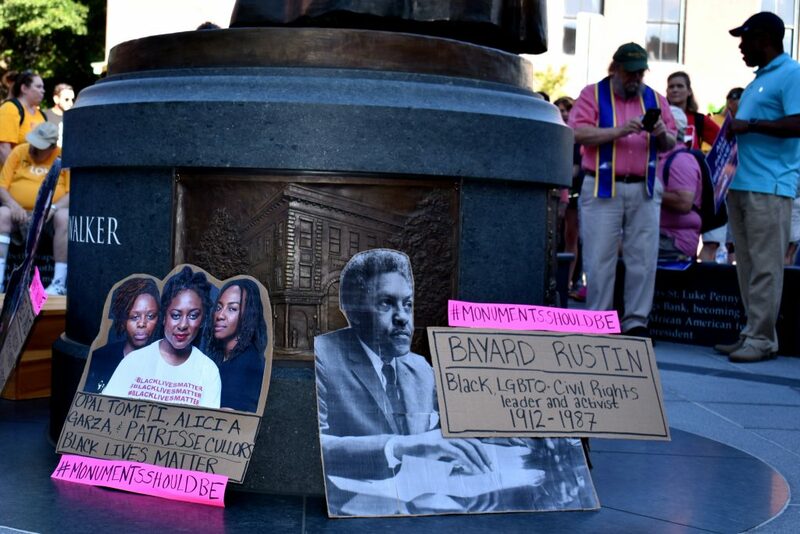 The hashtag #MonumentsShouldBe is used to display people of color and LGBTQ people. On the sidelines, a Methodist minister described his motivation for attending. “I love God, I love Richmond, and I hate racism.” Next to him, a fellow pastor said, “Just justice, man. 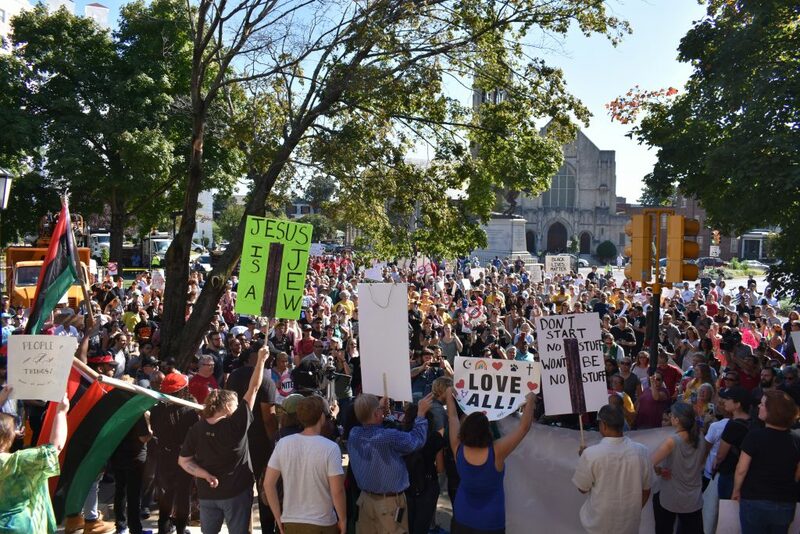 Just justice.” As the rally ended, they took to the sidewalk, followed by unaffiliated fellow counter-protesters from the Democratic Socialists of America and the Virginia Defenders, headed for a second rally at First English Evangelical Church at Stuart Circle. 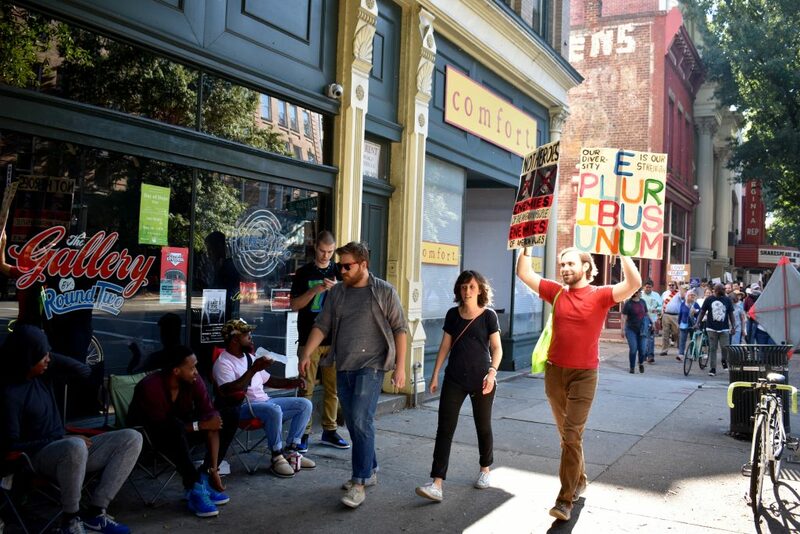 The interfaith group, joined by other activists, marched beside Broad Street on the sidewalk. The law-abiding group marched around 9:30, staying on sidewalks and coordinating with Richmond Police to keep road crossings safe and clear. They joined Hawk Newsome of Black Lives Matter of Greater New York and several local BLM chapters, standing together on the stairs to address the crowd. Newsome talked about the history of racism in Richmond, pointing to our status as Capital of the Confederacy and the slave markets here, before introducing a series of speakers. Hawk Newsome on the steps of the Lutheran church at Stuart Circle. Black Lives Matter members spoke in front of Lee. After remarks, they and the interfaith group marched to the inner barricades of the Lee Statue, chanting for racial justice and equality. Protesters were without body armor or melee weapons, per earlier instructions by the police, who had no issues with banned items. 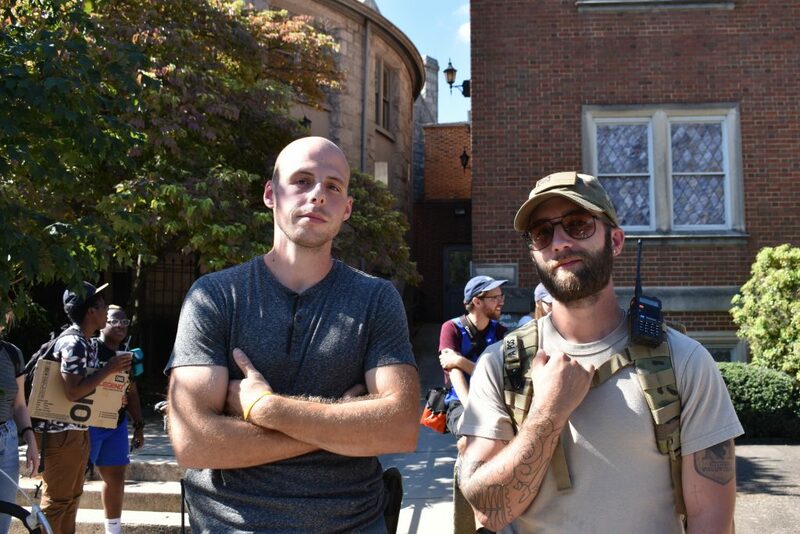 A few men looked on disapprovingly, expressing worries that the peaceful group could turn violent, but the demonstration stayed peaceful and largely dispersed after a short period of chants and speeches. These locals watched the rally and march. In the buildup, police were widely credited by neighborhood association leaders and others for being communicative and proactive. They cordoned off the area around the Lee Monument on Friday, using city trucks, barricades, and police tape, and temporary fencing to limit access to homes. There were no reported acts of vandalism or property damage. Hundreds gathered in Stuart Circle as part of a joint rally held by local interfaith groups and various Black Lives Matter chapters. Police in riot gear followed behind marchers. Riot Police separated two neo-Confederates from counter-protesters. This Trump supporter came to talk about racism as a bigger issue in America. 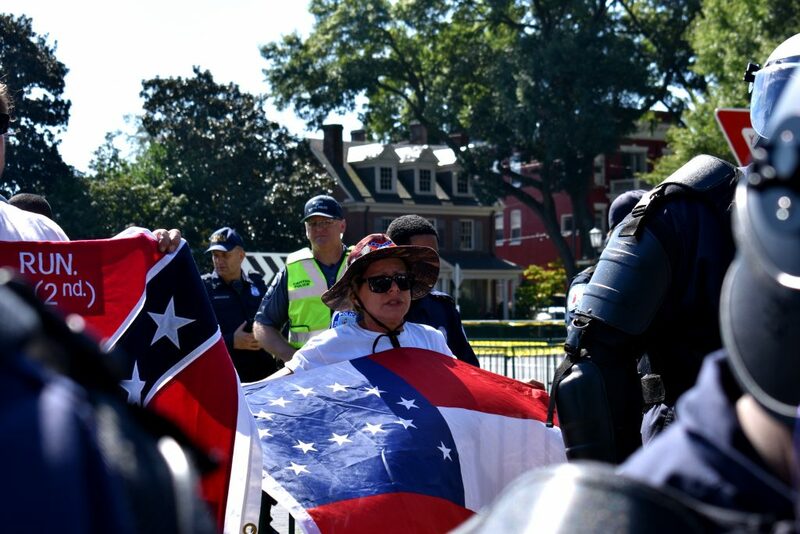 At the barricades, the woman who’d been engaged in verbal sparring earlier had reached a man holding a Confederate flag and the riot police, who moved in to separate her from the crowd and de-escalate the situation. Safely separated, the large mass of protesters continued to jeer and boo as she yelled back, sometimes addressing individuals directly, other times the whole assembly. Off to the side, a different debate was happening, at a different tone of voice. 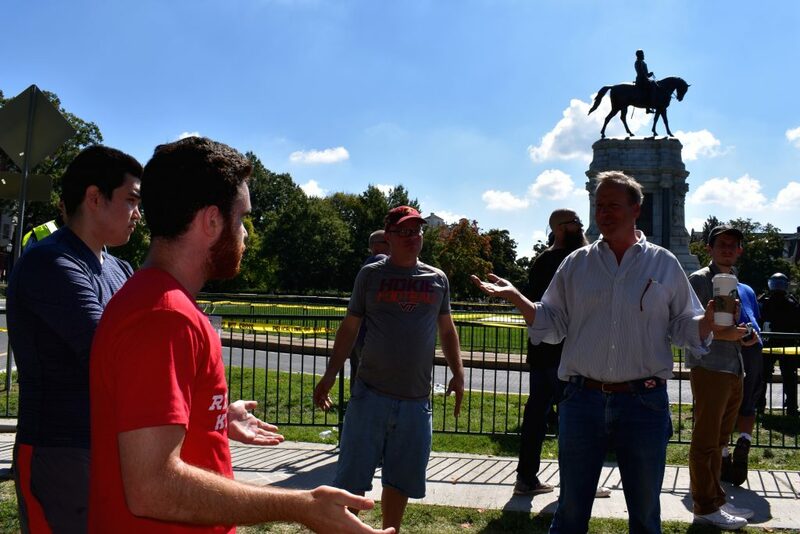 Two men, one younger, one older, argued the merits of the monuments, the history of Richmond, and shared differing views on the lives of the men memorialized by the statues. As they began to debate socialism versus capitalism, protesters began to disperse, bringing a peaceful and fitting end to the rally. A peaceful and reasoned debate about economics took place near the end. But what about CSA II, the group that planned and organized this rally? According to social media, they are seeking $1000 on GoFundMe to cover towing fees and tire replacement to get home to Tennessee and Florida. *Additional reporting contributed by Nidhi Sharma. Cover photo by Landon Shroder, other photos by David Streever.